Place bottom halves of buns on serving platter. For each monster burger, place 1 cooked patty on bottom half of bun. Cut cheese slice in half in zigzag pattern to look like teeth. 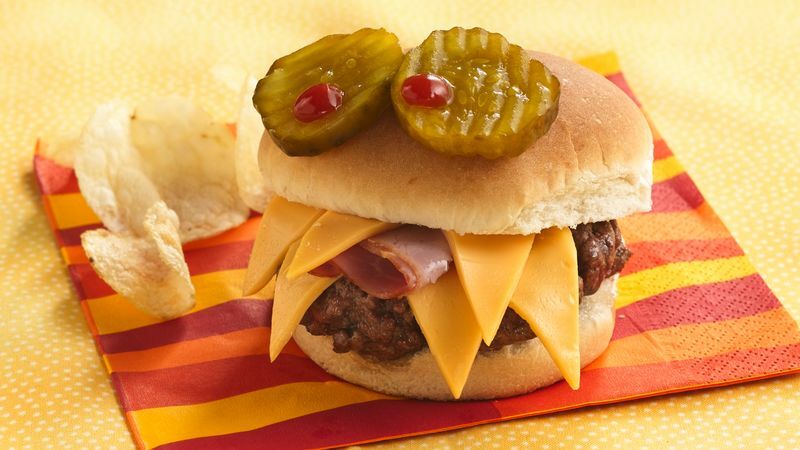 Place half of cheese slice on burger, with "teeth" hanging off 1 side of patty. Loosely fold ham into tongue shape; place on top of "teeth." Place remaining cheese "teeth" on top of "tongue." Top with top half of bun. Place 2 pickle slices on top for eyes. Dot "eyes" with ketchup for pupils. If you purchase frozen ground beef patties, thaw them before cooking.